LOS ANGELES, Oct. 11, 2018 /PRNewswire/ -- Beginning today – Thursday, October 11, 2018 – at 4 pm ET/1 pm PT, Reach Out WorldWide (ROWW) will be unveiling a colossal slate of rewards and signed collectibles direct from the set of Vin Diesel's upcoming BLOODSHOT feature film in support of the fourth annual Game4Paul charity fundraiser – a livestreamed event full of games, exclusive sweepstakes and more that will support ROWW's mission to provide natural disaster relief across the globe. 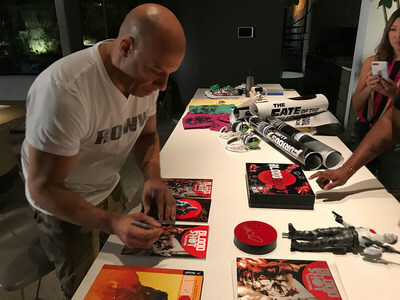 Bloodshot star Vin Diesel signs exclusive items for fourth annual Game4Paul fundraiser. The livestream will also honor the life and legacy of actor and ROWW founder Paul Walker. Tune in today at 4 pm ET/1 pm PT on Tiltify, Facebook Live, Twitch Xbox Channel, and Mixer Xbox Channel to catch all the action with some of Paul's friends and family, including actors Vin Diesel, Tyrese Gibson and Sung Kang from THE FAST AND THE FURIOUS franchise, alongside Cody Walker, Paul's brother and CEO of ROWW. ROWW and Xbox have teamed up for this year's Game4Paul charity fundraiser that will include more than a dozen exclusive prizes and rewards donated directly from the set of Sony's BLOODSHOT – the much-anticipated feature film adaptation of the Valiant Entertainment comic book series from director Dave Wilson, writer Eric Heisserer, producers Neal Moritz, Toby Jaffe and Dinesh Shamdasani, and starring Vin Diesel, Guy Pearce, Eiza Gonzalez, and Sam Heughan. Valiant's BLOODSHOT comic book series, which has sold more than 7 million copies since the character first debuted in 1992 and earned multiple Eisner and Harvey Award nominations, follows Ray Garrison aka Bloodshot, a deceased soldier resurrected by weapons contractor Rising Spirit Technologies through the use of nanotechnology. Suffering from total memory loss but imbued with an array of staggering new abilities, Ray struggles to reconnect with who he was while learning what sort of weapon he has become...aided by a team of fellow augmented combatants codenamed Chainsaw. 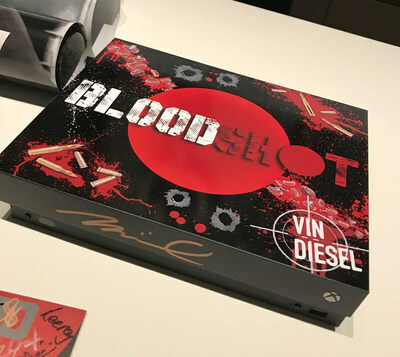 BLOODSHOT-THEMED CUSTOM XBOX ONE X CONSOLESigned by Vin Diesel / Only Copy Ever Produced Get your hands on an exclusive, one-of-a-kind Xbox One X console – fully customized to feature exclusive artwork and detailing from Sony's upcoming BLOODSHOT feature film and signed by none other than BLOODSHOT star Vin Diesel himself! Comes complete with a 1TB hard drive, an Xbox Wireless Controller, 1-month of Xbox Game Pass and 14-days of Xbox Live Gold so you can enjoy 100 great games right out of the box. With Xbox One X, enjoy immersive true 4k gaming, 4k Blu-ray and 4k video streaming. 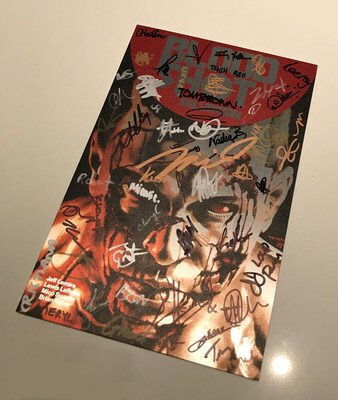 BLOODSHOT SALVATION #12 VIN DIESEL VARIANTSigned by Vin Diesel / Only Copy Ever Produced The rarest Bloodshot comic book EVER produced – signed by Vin Diesel, star of Sony's upcoming BLOODSHOT feature film! 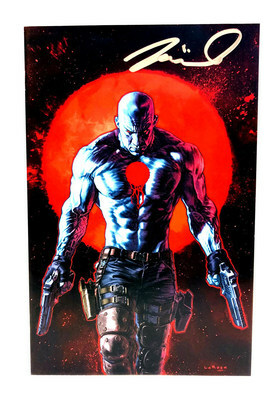 Specially manufactured for Game4Paul this ONE-OF-A-KIND edition of the BLOODSHOT SALVATION #12 comic book comes complete with an exclusive cover featuring art by legendary comic artist Lewis LaRosa, imagining superstar Vin Diesel as Valiant's relentless comic-book hero and signed by Diesel himself! BLOODSHOT SALVATION #1 BRUSHED METAL VARIANT Signed by Cast & Crew One of the rarest and most sought-after Valiant comic books ever released – signed by 55 members of the cast and crew of Sony's upcoming BLOODSHOT feature film, including stars Vin Diesel, Guy Pearce and Sam Heughan, director Dave Wilson, producers Toby Jaffe and Dinesh Shamdasani, and more! BLOODSHOT CUSTOM-PAINTED CONVERSE CHUCK TAYLOR ALL-STARSSigned by Vin Diesel A pair of custom Bloodshot-themed Converse Chuck Taylor All-Stars – painstakingly hand-painted by NYC street artist "AKA MAG" for the team behind Sony's upcoming BLOODSHOT feature film. This pair, given to Vin Diesel in honor of his role in BLOODSHOT, features his likeness as Bloodshot and comes signed by Diesel himself! To donate for a chance to win these items and more, visit Game4Paul.com starting today! All proceeds will benefit ROWW, so check out the full list of rewards and ways you can contribute to this important cause. The Game4Paul livestream will also feature Vin and Cody throwing down in an exclusive Xbox Game Pass Challenge. Vin and Cody had to complete a series of challenges in a variety of games, all of which are available in the Xbox Game Pass catalog, including completing the motocross showcase challenge in the new Forza Horizon 4, as well as challenges in Cluster Truck, Super Mega Baseball, and Rocket League. For each challenge Vin and Cody completed, they earned $10,000. Tune in during the livestream to find out how much money they raised for ROWW! Don't miss Game4Paul airing on Tiltify, Twitch Xbox Channel, Mixer Xbox Channel, and Cody Walker's Facebook Page on Thursday at 4 pm ET/1 pm PT.